The jet stream is frequently thought of by most skiers and snowboarders as the thing to pay attention to when looking for a big storm. But this isn’t exactly the case. 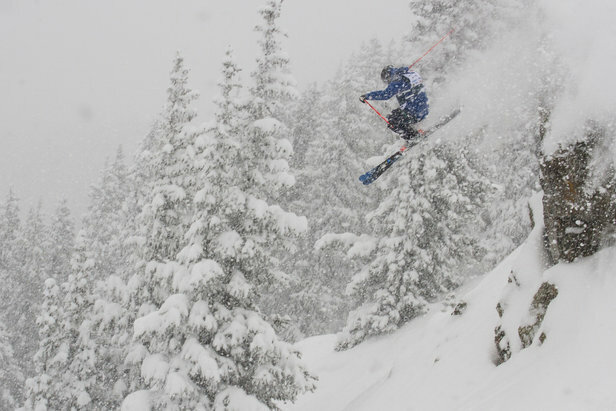 Here’s a bit more about the jet stream and how you can sometimes use it to help forecast powder days. Detailed knowledge of the jet stream is only about 50 years old. Pilots during World War II helped to solidify our understanding of this phenomenon, however it was actually back in the 1920s when a Japanese meteorologist tracked high-altitude balloons and first understood that there might be an area of faster moving winds in the upper atmosphere. And that is the definition of the jet stream: An area of faster-moving winds in the upper atmosphere. You can think of it like a river of fast moving air at about the altitude where planes fly, around 30,000 feet. Unlike earth-bound rivers, this atmospheric river is constantly changing position, shape and speed. The wind within the jet stream can blow at 100 to 200 mph, much faster than air away from the jet stream that usually sticks to speeds of less than 50 mph. The simplest explanation of the jet stream is that it is located between warmer air to the north and colder air to the south. The rapid change in temperature between the cold and warm air forces a faster flow of air at about 30,000 feet. There are actually two jet streams in each hemisphere. The polar jet stream is usually the stronger of the two and is usually located over the mid latitudes (near the United States, Canada and Europe). 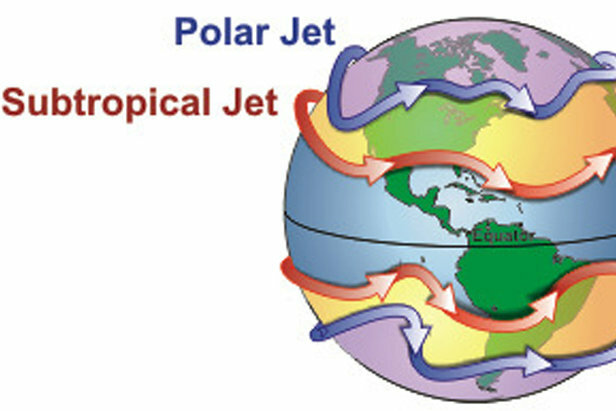 The subtropical jet stream is weaker and is often located much further south, such as the southern part of the United States. There are two areas of faster wind speeds in the upper levels of the atmosphere – the polar jet stream and the subtropical jet stream. These exist in both the northern and southern hemisphere. This background information is fun, but the main question is how the jet stream helps to create snow. First, let me dispel a myth. Many people think that simply looking for the jet stream in weather forecasts is the number one way to find storms. What most of these people do not realize is that the jet stream is not a constant in the atmosphere. Its strength, position and shape can change and are tied to weather systems across the world. Computer weather forecasts attempt to predict the location of the jet stream, but these forecasts will change as frequently as the details of snow forecasts themselves. The jet stream is a piece of the entire storm puzzle, but it’s not necessarily the driver of the storm. What the jet stream does provide to the storm is lift. Snow is formed when moisture in the atmosphere is lifted. 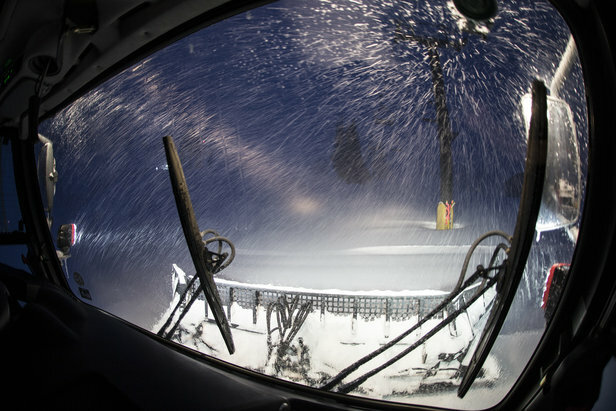 Lifted air expands, cools and the moisture condenses into snow. Due to some complicated physics equations, the jet stream at 30,000 feet helps to lift the atmosphere below it, so mountains that are below the jet stream can see additional snowfall due to the added lift provided by the jet stream. To find the jet stream on a weather map, you’ll often look for the 250 mb or 300 mb maps. These charts show winds at about 30,000 to 35,000 feet, and regions of faster-moving winds usually show the location of the jet stream. Knowing where the jet stream is located can help you find areas of heavier snow. But remember that it is only one piece of the complicated recipe of weather forecasting. Learn exactly what a water vapor satellite image is when trying to predict the snowfall for ski resorts around the country.